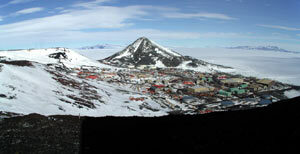 A panoramic view of the McMurdo station. In 1996, Texas A&M University and University of Texas researchers began developing a long-term environmental monitoring program for McMurdo Station, Antarctica. 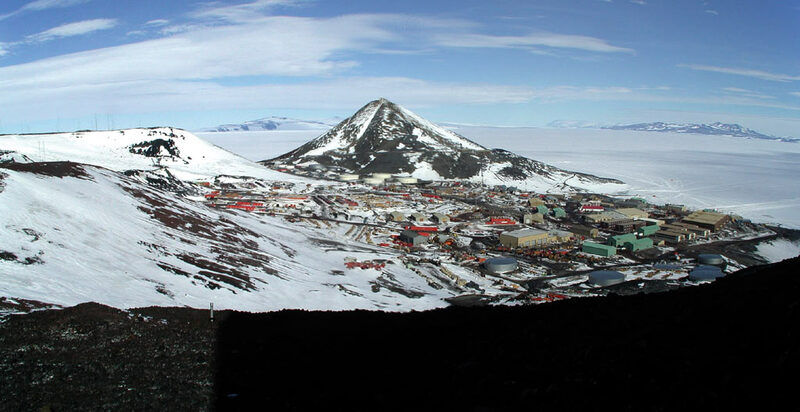 McMurdo Station is the largest U.S. Antarctic base and the logistical hub of the U.S. Antarctic Program (USAP) run by the National Science Foundation (NSF). It is located on the southernmost ice-free tip of Ross Island (77� 51� S, 166� 40� E). The station has been in continuous operation since 1955. The site was first visited by Sir Robert F. Scott's Discovery Expedition of 1901-1904, which overwintered there. Later British expeditions would utilize the historic hut, which still stands today, that was constructed during Scott's first expedition. Environmental stewardship is a cornerstone of USAP activities, and the logistics provided by McMurdo Station enable environmentally sound science to be conducted across Antarctica. All activities in Antarctica are governed by the international Antarctic Treaty, which reserves the region south of 60� S latitude for peaceful purposes and fosters international cooperation in scientific research. In October 1998 the Protocol on Environmental Protection to the Antarctic Treaty entered into force. This protocol requires that activities in Antarctica be planned and conducted to limit adverse environmental impacts. McMurdo Station's long-term environmental monitoring program, developed jointly by Texas A&M University and the University of Texas researchers, fulfills the protocol's requirements for monitoring the impact of ongoing activities. 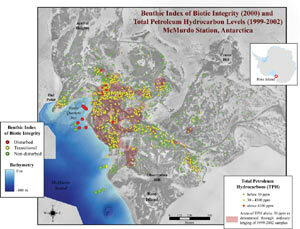 GIS aided University of Texas marine biologists in determining the location of marine sampling sites in McMurdo Sound. They located sampling sites at specific depths along four transects across areas of known disturbances. A fifth control transect was located in an indisturbed area near the station. Sampling sites were determined by depth and by viewing relevant infrastructure overlaid on bathymetric contours, including the station's sewage outfall and seawater intake. Because of the small spatial extent (meters or less) of much of the human impacts at McMurdo Station, careful consideration of geographic location is important in undertaking any environmental monitoring program. ArcGIS Desktop (ArcView and ArcInfo) and its ArcMap application were used extensively throughout the project's year-long planning phase and its three-year pilot phase, beginning in 1999, and continue to be used during implementation of the monitoring program beginning in 2003. During the planning phase, researchers used ArcView to compile a spatially referenced database of historical environmental studies. Using ArcView to visualize the locations of known contamination and historical environmental sampling over station infrastructure maps and orthorectified aerial photographs aided greatly in developing strategies to sample the landscape surrounding and adjacent to the station. The largest environmental contaminant at McMurdo Station is fuel, on which the entire USAP runs. Fuel spills, largely a legacy of former practices, have resulted in meter-sized areas of contamination. Researchers used ArcView and ArcInfo to design and test several stratified random sampling schemes capable of efficiently detecting changes in the overall levels of contamination at the station and to monitor changes at specific areas of concern. 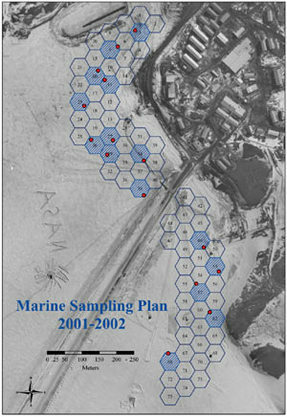 Nested sets of square and hexagonal sampling grids were created using ArcInfo and its ARC Macro Language (AML). 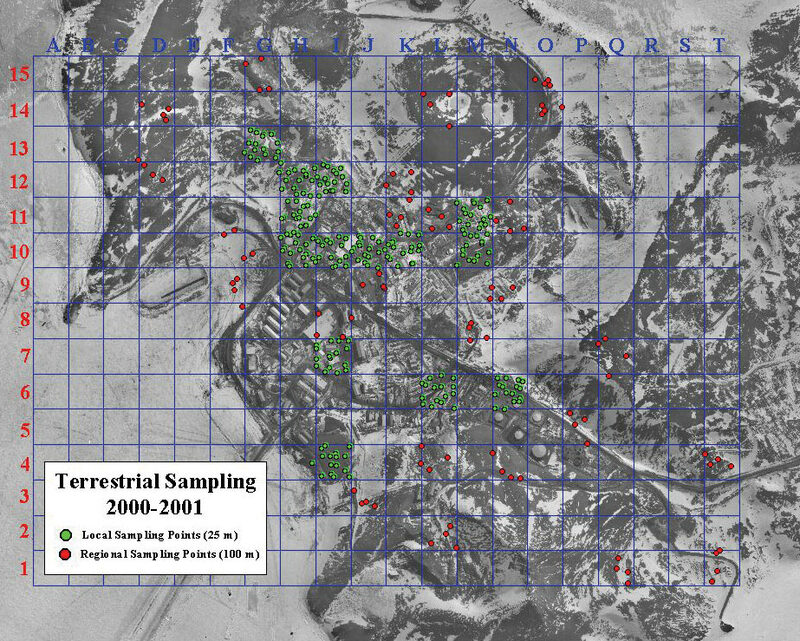 Coarse 100 m grids enabled sampling across the entire station, while finer 25 m and 5 m grids allowed sampling of the heterogeneous patterns of contamination at impacted sites, such as around fuel tanks. GIS helped assure the collection of a spatially random sample. Researchers randomly selected grid cells to sample and determined the sampling location within each cell through loose coupling of ArcInfo with statistical and other mathematical software packages. They navigated to the random sampling sites in the field using maps created in ArcView in conjunction with a differential GPS unit. Once a sampling site was located, they collected a surface sample and later geochemists at the Geochemical and Environmental Research Group (GERG) at Texas A&M University analyzed it for total petroleum hydrocarbons (TPH) and selected metals. Using this GIS-enabled approach, nearly 2,000 terrestrial samples have been collected to date during four field seasons. This field collection program would not be possible without the GPS support and expertise provided for Antarctic research by UNAVCO, Inc. (www.unavco.org), a nonprofit organization that supports and promotes GPS and other high-precision geodetic techniques in the earth sciences. 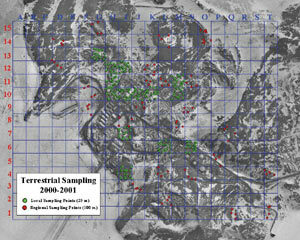 Using the GIS-enabled approach, nearly 2,000 terrestrial samples have been collected to date during four field seasons. ArcView, and more recently its ArcMap application, serves as the primary means of analyzing the spatial patterns of specific measured contaminants, such as TPH or lead. Maps produced by ArcMap are a primary vehicle for disseminating information to a wide range of audiences. Information dissemination is important as the monitoring program is designed to support environmental management and decision making. 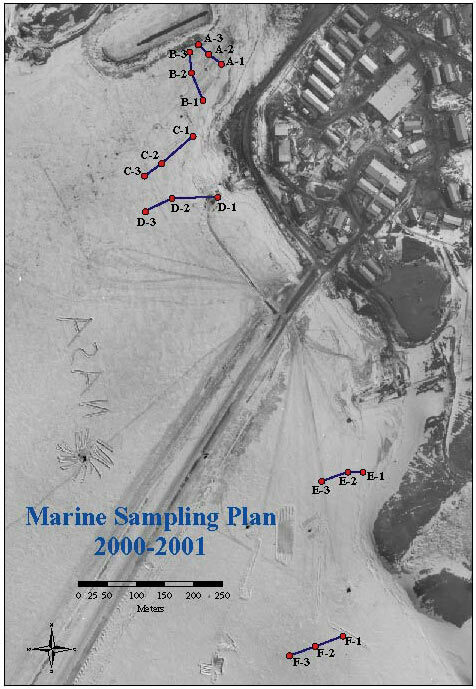 ArcView aided University of Texas marine biologists in determining the location of marine sampling sites in McMurdo Sound. They located sampling sites at specific depths along four transects across areas of known disturbances. A fifth control transect was located in an undisturbed area near the station. Sampling sites were determined by depth and by viewing relevant infrastructure overlaid on bathymetric contours, including the station's sewage outfall and seawater intake. The sites are reoccupied each year to assess change over time in response to changes in station operations, such as a new sewage treatment plant, and to capture gradual long-term changes. At each marine site, divers from Raytheon Polar Services, the primary support contractor to USAP, collect sediment cores for community structure analysis, sediment chemistry, and toxicity. Sediment toxicity is analyzed on the station by University of Texas marine biologists using light producing bacteria (Microtox). The sediment cores and terrestrial samples are shipped back to Texas via cargo ship. At Texas A&M University, geochemists measure levels of TPH and polycyclic aromatic hydrocarbons (PAH), polychlorinated biphenyls (PCB), and selected metals in the terrestrial and marine samples. University of Texas researchers use the community structure of organisms in the cores to compute a benthic index of biological integrity, which measures the ecological integrity of each marine site. 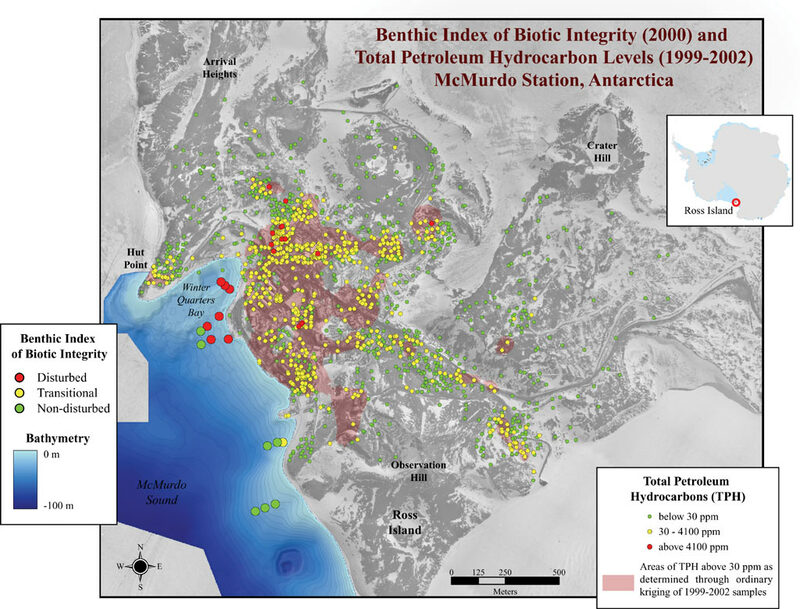 Levels of disturbance in McMurdo Sound near the station as measured by a Benthic Index of Biotic Integrity and Total Petroleum Hydrocarbon Levels measured at the station overlaid on an orthorectified aerial photograph and color-coded bathymetry. Most human inpact is confined to areas within a few hundred meters of the station. An extensive archive of aerial photography owned by the United States Geological Survey (USGS) exists for Antarctica, including McMurdo Station. Using the ArcGIS Desktop application ArcMap, researchers mapped footprints of buildings, fuel tanks, and roads from aerial photographs dating as far back as 1960. They created a disturbance history of the station by overlaying a hexagonal grid over the station and its immediate environs. The date of the aerial photograph recording the initial physical disturbance in each polygon was then identified in ArcMap. This mapping revealed that the majority of physical disturbance around McMurdo Station occurred within the first 15 years of the station's existence. ArcGIS will continue to play an important role in supporting McMurdo Station's long-term environmental monitoring program. By allowing a user's current position to be viewed over aerial photographs and station maps, mobile GIS technologiessuch as ArcPadwill allow field sampling to be accomplished more efficiently. Moreover, GPS is currently being used to collect extensive location information about operational activities across USAP, including helicopter landing sites, fuel caches, and spills. As the quantity of this geolocated, environmentally relevant information increases, GIS will play an increasingly important role in environmental stewardship of United States activities in Antarctica. Andrew Klein, Mahlon C. Kennicutt II, and Steve Sweet are with Texas A&M University, and Paul Montagna and Sally Applebaum are with the University of Texas. For more information, contact Andrew G. Klein, associate professor, Department of Geography, Texas A&M University (e-mail: klein@geog.tamu.edu, tel. : 979-845-5219). The project's Web site (www.gerg.tamu.edu/antarctica) is hosted by the Geochemical and Environmental Research Group at Texas A&M University.